A 3D adventure where the player must scale and rotate his environment to complete puzzles and defeat enemies. The game is a puzzle platformer. I scripted the rotation mechanic using C-Lite, a flavor of C. The original concept was created for a student project. Project Goals: Create a full game design implementing two different gameplay mechanics. What I did: I used my extensive knowledge of the 3D Gamestudio game engine to code a player movement, Enemy AI, Sound, Shader Rendering, Animation, and UI. The rotation mechanic in This End Up was born by committee. The original idea came from the prototype from Bob the Blob – that game the prototype asked the question – what happens if you are able to manipulate yourself and the environment to solve puzzles. (See Bob the Blob For more details on that project) We ran out of time to implement the full feature in that project. (We were able to make the blob change his shape, but we were unable to give the player the ability to manipulate the world) When the group reconvened, we decided that we wanted to explore manipulating the world further. We decided that we needed to lock down how the player would actually control this rotation. We settled on the player being able to rotate his world by hitting special gears or cogs that were placed throughout the world. 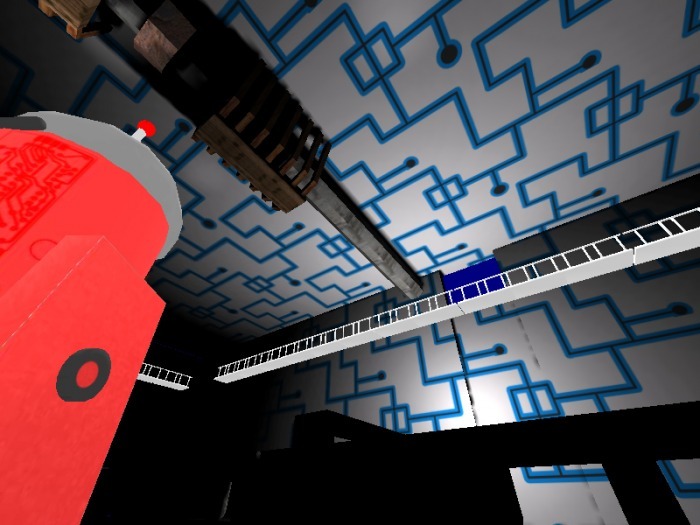 The player is temporarily lifted up while the entire level around him rotates. Depending on the gear, each room can rotate multiple ways. The player can use this to escape rooms and defeat enemies. Each time the player rotates the room, enemies are thrown into spikes and other hazards. The player has to be careful not to throw himself into these obstacles however. This is where the interesting choice comes into play. 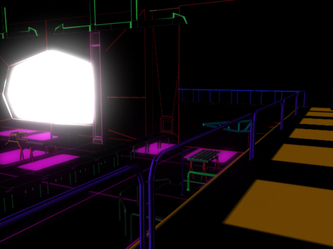 I implemented the script to allow the player to rotate each room around him. I also implemented the scripting to allow enemies to die when they fall from high ceilings. Code to handle rotation. I set up a loop to check the distance of the player. If the player was close enough, the trigger would rotate the object that this is attached to. action 1strotate    // this is the first rotate for memo's room. There should only be one.